There has long been a need for a systematic introduction to the modern pure theory of international trade that would take the student through a careful introduction to the tools of analysis and the main logical propositions into the application of the theory to practical problems of international economic policy. Trade theory should be part and parcel of price theory, distinguished only by the fact that other countries form part of the natural opportunities--and natural constraints--that a country confronts in its efforts to bend nature to its desire to produce utility-yielding goods and services; but its exposition is often confused by the attachment of its expositors to obsolete problems and backward analytical techniques. 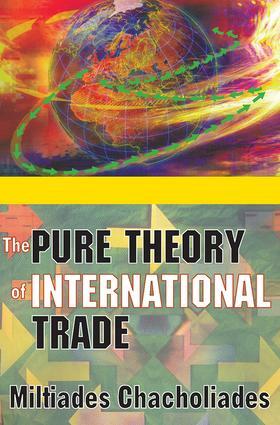 This book covers in detail classical, neoclassical, and modern theories of international trade, with special attention to problems of equilibrium, growth, and welfare, and discusses the work of all major contributors in this field from Ricardo and Mill through Meade, Heckscher, and Ohlin, to the growth models of Johnson, Solow, and Uzawa. All problems are clearly stated and the easiest and most convenient solutions are sought in each case, with the more technical topics in the field discussed in several chapters and appendixes that may be omitted for less advanced students without interrupting the continuity of the book. The book's coverage is complete and entirely up-to-date. It is written primarily for advanced undergraduate and graduate courses in international trade, but it will also serve as an important reference tool for professional economists working in this field and will be of considerable interest to students and practitioners dealing with problems of economic development and international business relationships more generally.